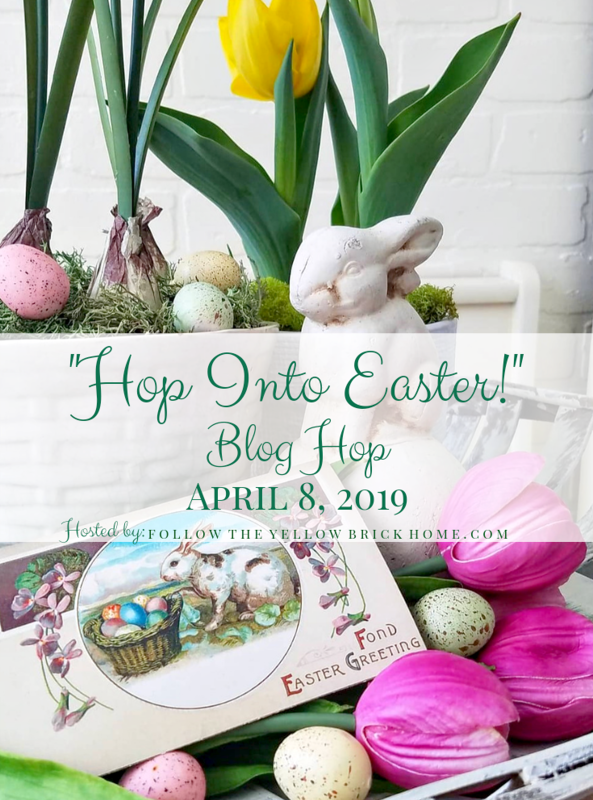 I am excited to announce that today I am joining a wonderful group of bloggers for a Hop into Easter Blog Hop! Before we get started, a big thank you goes to Amber from Follow the Yellow Brick Home for hosting! If you don’t already follow her lovely blog, you will definitely want to do that! If you are just arriving from Shannon’s blog, Belle Bleu Interiors,…Welcome! Shannon shares my love for blue and white and her decor is always so beautiful! At the end of this post, you can find a list of all the participants in the blog hop. Be sure to visit as many as you can for some creative Easter ideas! Aren’t these napkin rings adorable? Recently, while food shopping at Wegman’s, I spotted them and had to buy a bunch! Usually, I decorate with fresh flowers for my centerpiece, but these bunches of pink faux flowers are a great alternative. In order to add more color to my Easter table setting, I filled two glass hurricanes with some colored eggs. Once again, I went with faux. Why bother with all those messy dyes when you can buy a bunch of artificial eggs for barely any money? Plus, I can use them again next year. I am not sure if I am getting smarter or lazier in my old age – ha! As you can see, the eggs pick up the colors in the table settings. Who doesn’t love pink and green for spring?!! Recently, I purchased these green cabbage salad plates. For years, I have been wanting a set to go with my Blue Willow plates that I used in last year’s Easter Table Setting. I love adding some green to blue…and obviously to pink! While in Homegoods one day, I picked up these adorable green cabbage bowls with two bunnies attached. Obviously, I can only get away with using them for Easter but they were cheap and go so well with the plates. So, I thought…why not? Sometimes, small pops of color are just enough. In order to keep my table from looking too busy, I kept the background neutral with seagrass place mats and a burlap runner. That way, those cute bunnies can really be the star of the show! 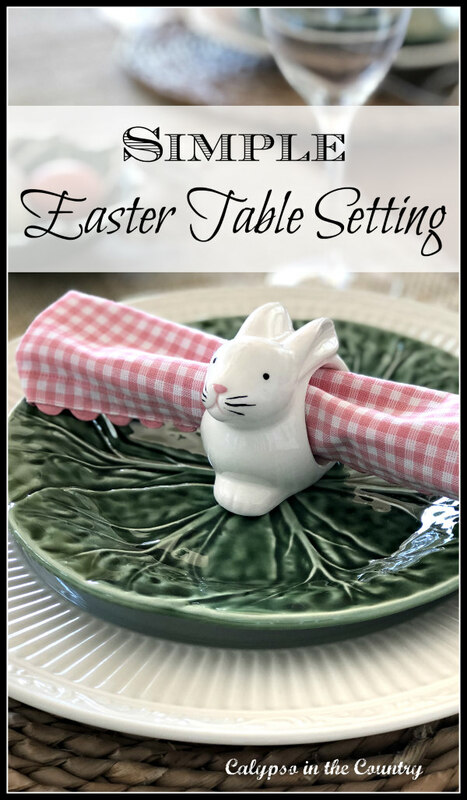 I hope you enjoyed my Simple and Festive Easter Table Setting! 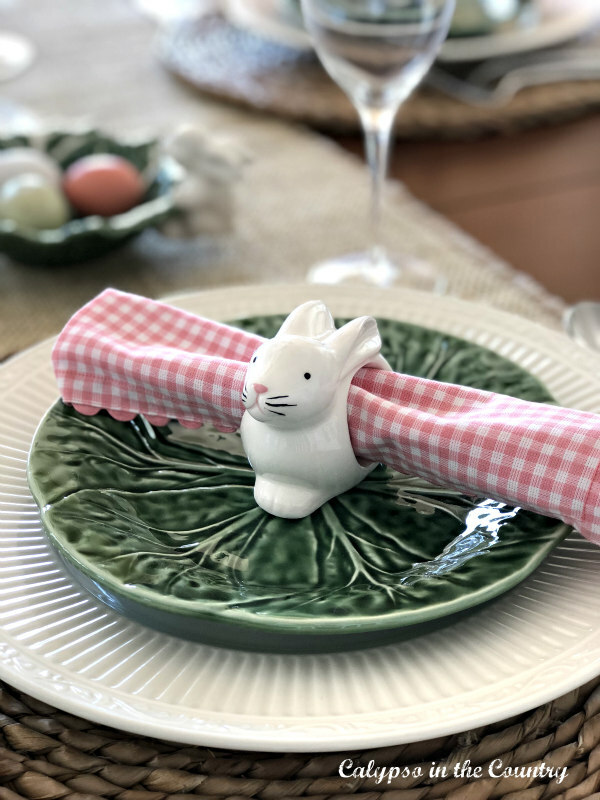 Bunny Napkin Rings – Wegman’s Food Store and these porcelain bunny napkin rings are adorable too! Green Cabbage Salad Plates – Sur la Table website or the same ones here. 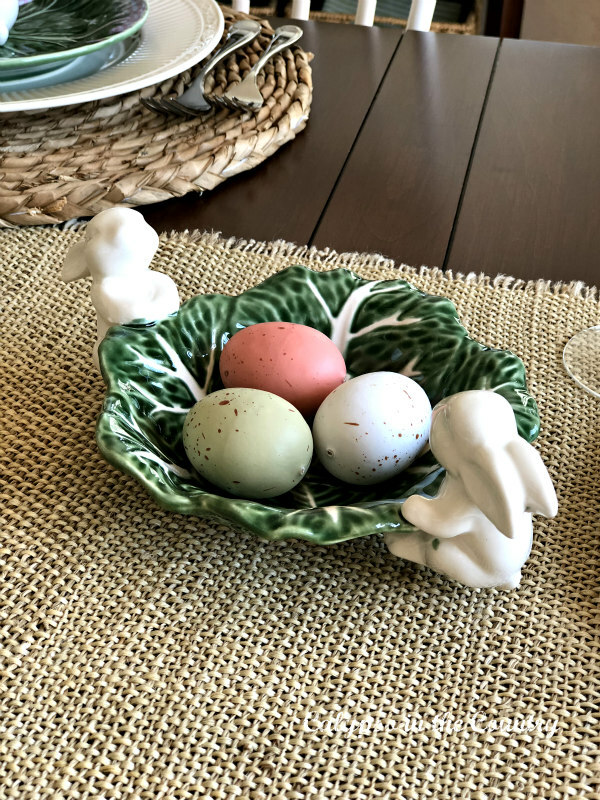 Green Cabbage Bowls with Bunnies – Homegoods but I also found another adorable version of a bowl with bunnies. White pitcher – Homegoods usually carries them or try this white pitcher. **Next, be sure to “hop” over to visit my dear friend, Paula at Virginia Sweet Pea! I had the pleasure of meeting her in person last fall and she is as sweet in real life as I imagined! Paula’s blog is always filled with beautiful ideas and decor so don’t miss it. I am sure she will inspire you as well! Remember to visit each of participants on the tour for tons of Easter inspiration! Cute, cute. I love the green dishes. They are so perfect for Easter. Thanks Katie! I definitely crave color this time of year! What a sweet tablescape! I adore your lettuce plates. Thanks, Laura! I definitely kept it simple since I don’t have many Easter pieces. I figure those green plates can get a lot of use though! We are smarter AND lazier! I love it all. I’ve been pondering what to do with all my eggs as most of my next two weeks will be spent at Rick’s caregiving, probably including Easter dinner which may or may not be able to be eaten sitting at a table. 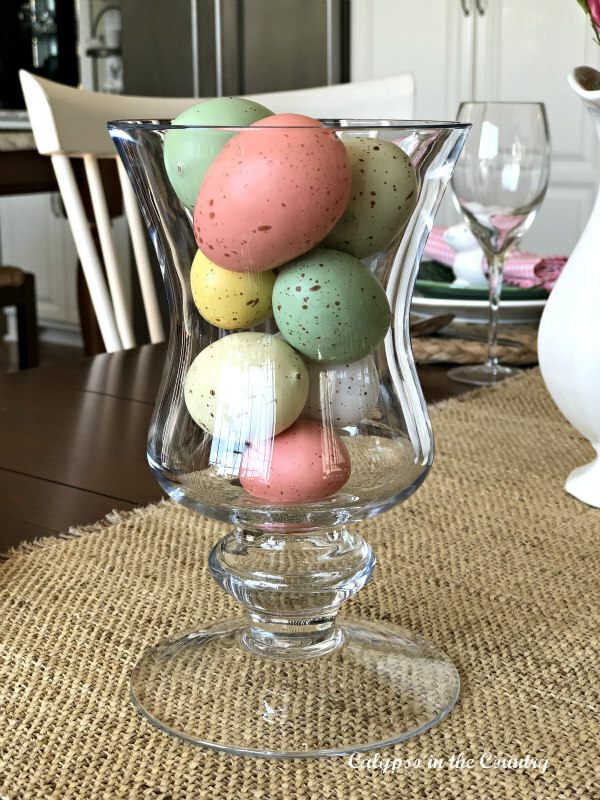 I may just fill a lovely vase with those eggs and take them down the street to have a little easter color with my holiday! Yes, smart and lazy…not bad traits, I guess! Thanks so much for your sweet comment. Definitely do something to display your pretty eggs. Thanks for stopping by and have a wonderful day! Oh I love it and your new napkin rings are amazing. Thanks, Marty! I just couldn’t resist buying them! So pretty Shelley! Those are great looking faux eggs….I am very tempted!! Thanks Cindy! I am sure we will end up coloring some real ones as Easter gets closer but these definitely work for now! Thanks, Coco! I love pink and green together too…so springy! Thanks for stopping by to see my Easter table! Great minds think alike. We have the same eggs from Michael’s. I love the bright colors. Your table looks fabulous and I love those cabbage bunny dishes. I’d be very happy sitting there. You can’t go wrong with Michael’s for that type of thing! Thank you…I love decorating with color in the spring! Shelley, there isn’t anything wrong with smarter! Your table is perfect for Easter with your cute bunny napkin rings. I use my cabbage leaf salad plates regularly, you will enjoy having those. I would use the cabbage bunny bowls all spring and summer, they are too sweet to put away. Thanks Pam! I am sure we will dye some real eggs at some point! I am glad to know you get a lot of use out of your cabbage plates. I have a feeling I will too! Thanks for stopping by! 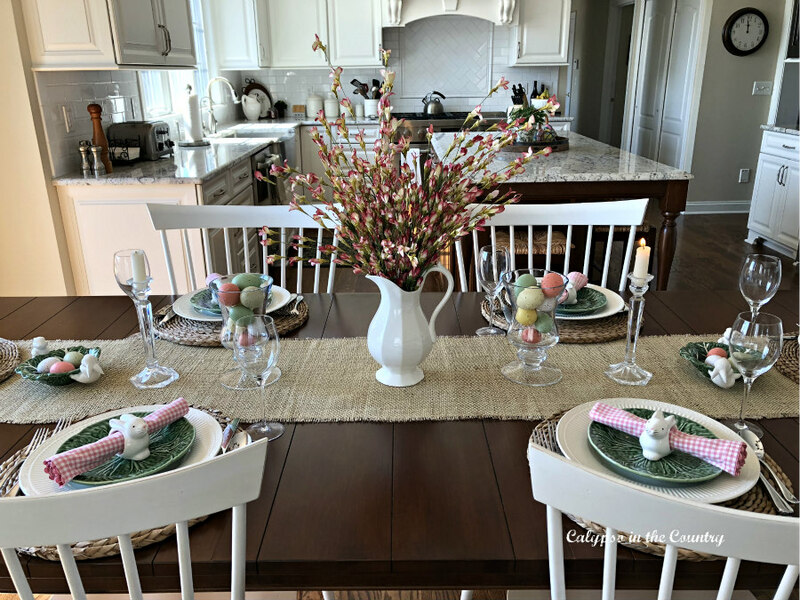 Hi Shelley, Your Easter tablescape is just adorable. I love the simplicity of your pink branches in the pitcher for a centerpiece and your fun bunny napkin holders. Love the plate combo, Happy Easter! Thanks Debra! Yes, I did go with simplicity for the whole table. Although I love real flowers, when I realized I had those pink bunches I decided to go with them. Thanks for stopping by! Pink, green, and white is a perfect combination of spring and Easter colors! Your decorations are so lovely! I love the napkin rings and the way you stacked the eggs in the glassware! Thanks Linda! Pink and green is definitely one of my favorite combinations! Thanks for your sweet comment! Such a pretty tablescape. Love that the setting is not cluttered. Would love to have you join us at Homestyle Gathering on Tuesdays! Thanks so much, Julie! Yes, I tend to keep things pretty simple with my table settings. Thanks for the invite – I’ll stop by! Such a beautiful tablescape!! I absolutely love those sweet little bunny napkin rings!! Thank you, Emily! Yes, what a surprise to find those cute bunny napkin rings at a grocery store! Gotta love Wegman’s! The gingham napkins are a cute touch and I love the detail of the pink rick rack along the edges. Thanks, Carol! Yes, I love the little detail as well! Thanks for “hopping” by! Shelley, the colors and textures on your table are so festive and pretty. Love, love, love those pink gingham napkins!! Thanks Michelle! I love playing around with color this time of year! Have a great day! I think you can keep your cabbage bowl with the bunnies out all spring!! Rabbits are not just for Easter. Your table looks so fresh and inviting. Happy Easter!! Thanks, Carole…I might just do that! Thanks for stopping by and have a great day! Shelley, your table is set to make guests smile with those sweet little bunny napkin rings! I am glad you mentioned to look for your hopping bunny over your stovetop, I have always wanted one of those. Maybe I will find one on sale after Easter! Thanks so much – and yes, that bunny on the stove mantel is from Homegoods a few years ago. Hope you find one! Thanks for stopping by and have a wonderful day! Your table looks so darling, Shelley!! I have been searching for bunny napkin rings. I’ll have to check Wegman’s. Have a wonderful week. Thank you! 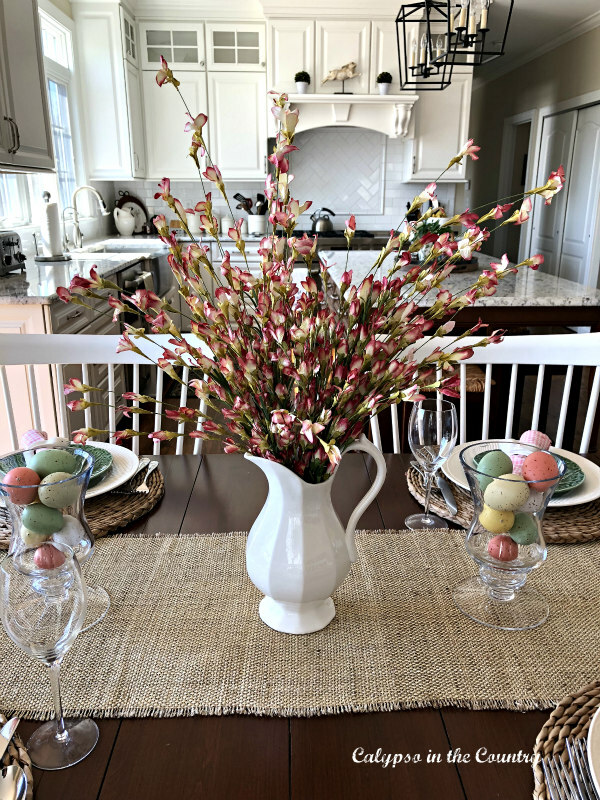 I love playing around with spring accessories…and now I have to pay more attention when shopping at Wegman’s each season! Have a wonderful day! Your table looks so pretty set for Easter. I love your bunny napkin rings and your new cabbage plates. I have a similar set of napkin rings and seeing yours reminds me that I need to get them out to enjoy. Thanks Paula! I look forward to seeing your napkin rings. You always have so many fun accessories! Great hopping with you! Beautiful….love the bunny rings! Thanks for the idea of putting eggs in the vases…I have some extra eggs and thought “what can I do with them”? Happy Easter! Thanks Ann! Glad to hear I gave you an idea! Thanks for stopping by and enjoy the rest of your week! Such a sweet table set in front of your beautiful kitchen. I saw the cabbage bowl with bunnies at HG, but left without it. Seeing it on your table, I’m so wishing I hadn’t! Thank you so much! That’s funny that you saw the bowl. Maybe it’s still there! Thanks for stopping by! I love the napkin rings and the cabbage bowls! All so cute! It’s such a pretty tablescape! Thank you Kristin! I kept it pretty simple but I am happy I found those napkin rings! Shelley, girl, you and I think alike. Love the bunny napkin rings with the pink gingham napkins. The idea of putting the eggs in the hurricanes is great ~ creates a focal point without eggs rolling around. Super sweet Easter table. Thanks Carol! After seeing your beautiful collection of bunnies, I think I need to step it up with my shopping! Thanks for hopping by! 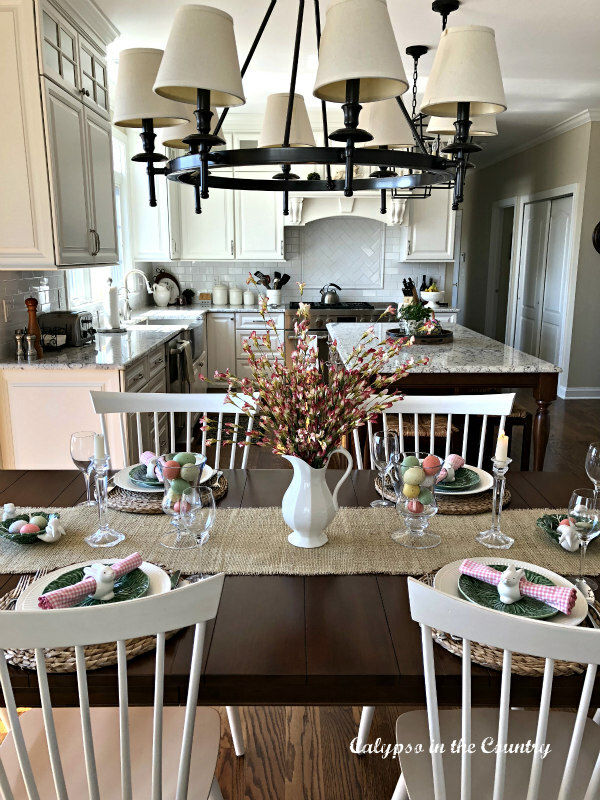 Your Easter table looks so beautiful and festive, and of course your gorgeous ktichen in the background is just as eye catching! I love white pitchers of flowers or branches of any kind, and yours looks perfect on your table The little bunny napkin rings and green cabbage and bunnies bowls are so cute. I also love the pink gingham napkins. I still like to color eggs if I get a chance, but I agree that there are some beautiful ones now that make life much simpler! Just turned 44 last week, so I am going for the simpler things now! Thank you so much for your thoughtful comment, Amber! We will probably still color eggs as it gets closer to Easter. I do though, like the convenience of using artificial eggs when decorating around the house. Thanks for stopping by to comment and for organizing the blog hop. I enjoyed visiting all the inspiring posts! Your green cabbage dishes are perfect for this season of the year. I enjoyed seeing your table set for Easter. Thanks Judith! I think I will be getting a lot of use out of those dishes. Thanks for stopping by! Shelley, We’re just smarter and wiser as we get older! 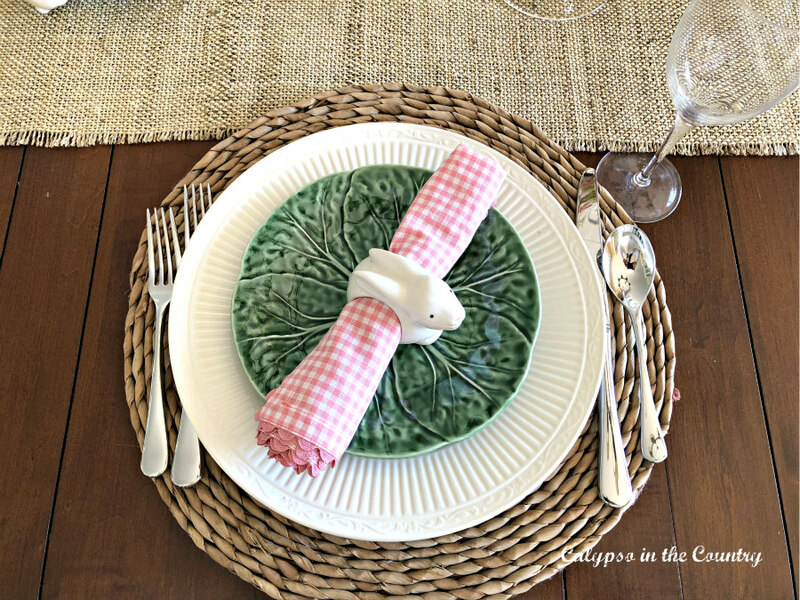 Anyways, I love those lettuce plates and the pink and white napkins with those cute bunny napkin rings are just perfect for Easter! Wishing you a Blessed Easter! Thanks Carol! Yes, smarter and wiser… I am glad you like the lettuce plates too. You will probably be seeing a lot of them on my blog because I imagine they are pretty versatile! Thanks for stopping by and best wishes for a happy Easter! I love the lettuce plates! They are so perfect for Easter!! Thanks Angelina! I think I will be getting a lot of use out of them! Thanks for stopping by to see my Easter table! I love the colors and textures you put together, Shelley! I’ve been picking up green leaf and cabbage plates here and there, too. They’re so fun to use this time of year! Thank you, Lora! Yes, those cabbage plates will definitely be in my rotation. Have a great weekend and great hopping with you! Shelly, your tablescape is so pretty! Those bunny napkin rings are adorable, and I just love the pink spray of flowers in your white pitcher. Thanks, Michelle! I definitely kept it simple because I don’t own too many Easter decorations. Although, after seeing everyone else’s posts, I think I might go shopping! So much inspiration out there. Thanks for swinging by! Thanks so much, Cecilia! I love using different fillers for those hurricanes. Have a great weekend! I love your sweet Easter table! The napkin rings are just darling and I adore your lettuce plates!! Everything looked beautiful!!! What a sweet comment. Thanks so much, Larissa! 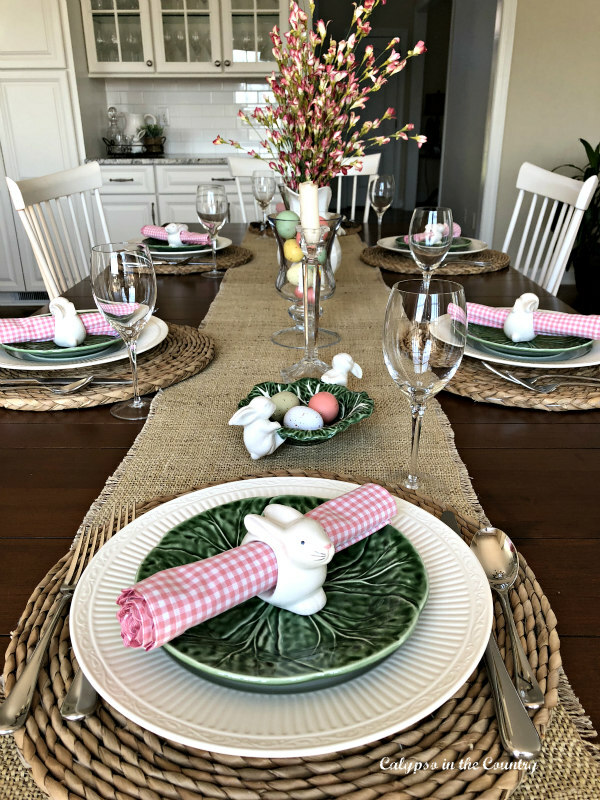 I kept my Easter table simple this year but I know I will be getting a lot of uses out of the new pieces…especially the plates. Have a wonderful weekend! Your kitchen is absolutely stunning! Such wonderful ideas for dressing an Easter table! I just love those eggs! Thanks so much, Christy! I am definitely loving the faux-egg option this year! Enjoy your day! Thanks so much, Marilyn! Have a great week! Oh what a nice surprise! Thank you so much, Marilyn!